NEW YORK -- The Madagascar exhibit at the Wildlife Conservation Society's Bronx Zoo is now home to three new lemur babies. 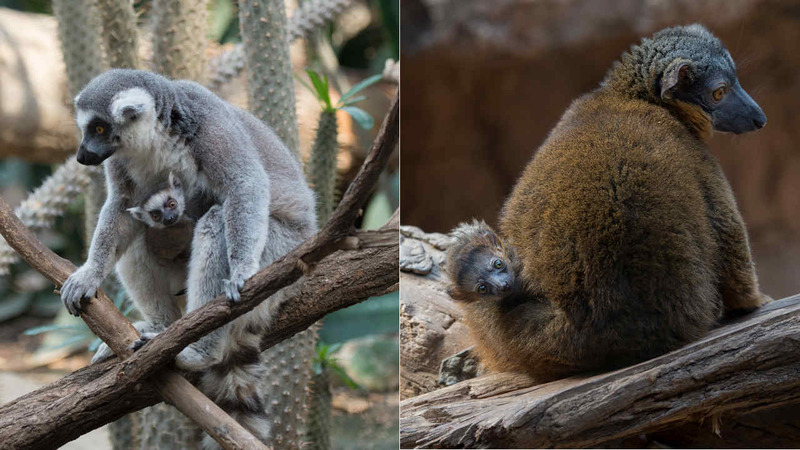 Two ring tailed lemurs and one brown collared lemur were born in late March and are making their public debut. Both species live in a naturalistic habitat depicting the Malagasy Spiny Forest along with critically endangered radiated tortoises and several bird species including vasa parrots, red fodies, grey-headed lovebirds, and ground doves. Guests hoping to catch a glimpse of the new additions will have to observe closely as young lemurs cling to their mothers and nestle in their fur. The Bronx Zoo has had tremendous success breeding lemurs as part of Species Survival Plans, cooperative breeding programs designed to enhance the genetic viability of animal populations in zoos accredited by the Association of Zoos and Aquariums. The Wildlife Conservation Society works to save lemurs and their disappearing habitat in the African island nation of Madagascar - the only place in the world where lemurs are found in the wild. Brown collared lemurs are native to the tropical forests of southeastern Madagascar. Ring tailed lemurs are native to the forests and bush in the south and southwestern portions of the island. Their habitats are being destroyed by human activity including charcoal production and slash-and-burn agriculture. Ring-tailed lemurs are very social and live in large matriarchal groups that often contain several breeding females. They are capable climbers, but spend much of their time on the ground. Newborns will ride on their mothers' chest and back for the first few weeks and will begin move around on their own within two-to-four weeks, but still stay close to their mother. Collared lemurs use their long tails to balance when leaping through the forest canopy. They live in groups of males and females but are not matriarchal like many other lemur species. The young ride on their mother's back hiding in her fur for the first few months of their lives. All lemur species are in trouble due to devastating loss of suitable habitat. The International Union for Conservation of Nature classifies both ring-tailed lemurs and brown collared lemurs as endangered in the wild. There are six species of lemurs on exhibit in the Madagascar! exhibit: ring-tailed lemurs, brown collared lemurs, red ruffed lemurs, gray mouse lemurs, crowned lemurs, and Coquerel's sifaka. Black and white ruffed lemurs are on exhibit at the Central Park Zoo. Opened in 2008, Madagascar! educates zoo visitors about the country's incredible biodiversity and how the Wildlife Conservation Society and partners are working to save its wildlife and wild places.